The private island costs extra. If you’ve been looking for the perfect excuse to vacation like a celebrity without (totally) breaking the bank, you might be in luck: The hotly anticipated Waldorf Astoria Maldives Itaafushi hotel and resort is now accepting reservations for trips that kick off July 1, 2019 and after. Plus, as of the February 11, 2019, you actually can cover your future stay using Hilton Honors points — a new development caught by the eagle-eyed team at The Points Guy. Of course, it takes a lot of points — or a lot of cash — to reserve your spot. The Waldorf Astoria Maldives resort is the height of luxury, even among accommodations at other Waldorf Astoria properties. This private island locale features 122 beach, reef and overwater villas, 10 specialty dining venues and bars and a world-class lifestyle spa and wellness sanctuary to help make your vacation unforgettable. So, exactly how many points will it take? The least expensive rooms available at the Waldorf Astoria Maldives resort are the king beach villa with pool or the two-queen bedded beach villa with pool. The former is a 2,518-square-foot villa with floor-to-ceiling windows, indoor and outdoor showers, his and her closets, multiple vanities, oceanfront views and a private deck and pool. The latter is slightly bigger at 2,604 square feet but comes with two signature Waldorf Astoria queen-sized beds. A stay at either of these lavish villas will cost you $1,833 or a minimum of 120,000 Hilton Honors points a night. Note that this price doesn’t include additional fees, taxes or service charges — though you can also rack up double the points if you pay a slightly increased rate of $1,942 a night instead. 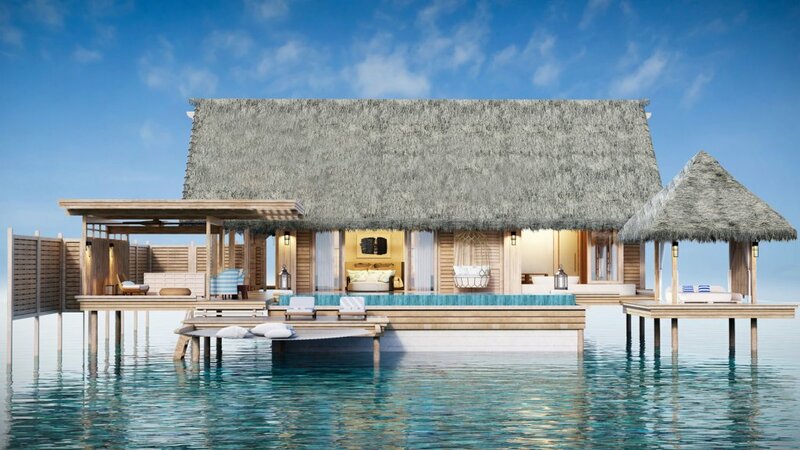 For those with a more decadent travel appetite (and budget), consider upgrading to the luxe Ithaafushi Private Island. The island comes with two villas, five bedrooms, five pools and a lavish entertainment center. According to The Points Guy, spending a night here will set you back nearly $50,000. Not yet a Hilton Honors member? You can sign up for free online. If you’d like to maximize both travel and hotel rewards points, apply for a Hilton Honors American Express Card. Once approved, you’ll get 50,000 Hilton Honors Bonus Points after you spend $1,000 on qualified purchases within the first three months that your account is approved. There are a number of Hilton Honors cards from American Express; the aspire lets you earn 150,000 Hilton Honors points once you spend $4,000 in purchases — plus, you get a free weekend night when you get approved and and each time you renew. Click through to read more about credit cards that are worth their sky-high annual fees.